Celebrate Jazz Appreciation Month at Levine Music, DC’s preeminent center for music education. Levine’s second annual JazzFest, April 17-19, features a headline performance by the GRAMMY award-nominated Vijay Iyer Trio, presented in partnership with Sixth & I Historic Synagogue. The weekend also includes an exceptional line-up of free master classes and jam sessions. Sunday, April 19, 7 p.m.
Vijay Iyer and his colleagues Marcus Gilmore (drums) and Stephan Crump (bass) have updated the classic jazz piano trio, creating powerful, cutting-edge new music that is firmly grounded in groove and pulse, but also rhythmically intricate and highly interactive; fluidly improvisational, yet uncannily synchronized; emotionally compelling, as well as innovative in texture, style, and musical form. 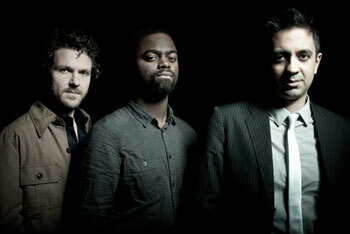 GRAMMY award nominees and Downbeat’s Jazz Group of the Year for 2012, the Vijay Iyer Trio is among the most celebrated ensembles in jazz. Sunday, April 19, 1 p.m.
Join 2013 MacArthur “Genius Grant” recipient and GRAMMY-nominated jazz pianist Vijay Iyer in a free masterclass featuring students from Levine’s Jazz Program, part of the 2015 Levine JazzFest. All members of the public attend and participate in a Q&A with Mr. Iyer afterwards. More info. Join us as we explore music composed by, and associated with, one of the greatest innovators and bandleaders in the history of jazz in a guided jam session setting led by Levine Faculty Lyle Link, Andrew Hare, and Chris Brown. Miles’ career spanned many periods of jazz – from bebop and cool to modal and fusion – and much of his bands’ repertoire is still regularly performed by veteran and up and coming musicians alike. More info. Saturday, April 18, 10:30 a.m.
Join Jazz Pianist and Levine Faculty member Paul Bratcher in a free master class investigating the role and development of swing rhythms in jazz, following the rhythms from their earliest African origins to 21st century interpretations. Through the use of recordings, live playing, and audience participation, Paul will shed light on what it means to swing and to develop one’s swing feel, with a particular focus on the changing role of the pianist. More info. Ulysses Owens, the multi-GRAMMY award-winning jazz drummer, will give a free master class focused on the art of brush playing. Ulysses has honed his own brush playing with some of the finest jazz musicians in the world including Wynton Marsalis, Christian McBride, and Dianne Reeves. In this master class he will explain and demonstrate some of the secrets of this little understood aspect of drumming. More info.